Raw foodism (or rawism) is a diet consisting of uncooked, unprocessed, and often organic foods or wild foods. Depending on the type of lifestyle and results desired, raw food diets may include a selection of raw fruits, vegetables, nuts, seeds (including sproutedwhole grains such as gaba rice), eggs, fish (such as sashimi), meat (such as carpaccio), and non-pasteurized/non-homogenized dairy products (such as raw milk, raw milk cheese, and raw milk yogurt). Many raw foodist are also vegan or vegetarian and are sometimes called "raw vegans" or "raw vegetarians"
Could you go completely raw for health reasons and just for your general well being? This does look pretty amazing huh? Check out Kristina's Youtube V8 juice with no added preservatives, salt or fillers. Just complete natural goodness. These simple ingredients make an amazing juice, bouncing with all the vitamins and minerals our bodies need. I am super intrigued, so much so that I am willing to go raw for one of our challenges this year, do you think you could do it with me as well? There is just something about it that draws me to trying to eat just fruit and vegetables including fish (I love sushi) along with nuts etc.... as I love them so much AND you know how much I love to experiment with food and recipes. I also know I would find it extremely fun trying all these superb new recipes. Having said that I primarily use raw or blanched style vegetable with our mains so I really don't see it being a big deal for me. Or am I kidding myself? Here is the person that has me intrigued. Her name is Kristina Carrilo-Bucaram from #fullyraw, she is a young, beautiful and sun shining 26 year old from Texas, USA with a Equador and Lebanese background. I think what grabbed me was her zest for life, her genuine kindness and love of raw food. Not to mention how beautiful she is and simply bounces off my screen every time I YouTube her channel!!! I had heard about raw people before when I started my healthy journey a few years ago but didn't think much of it as there is NO WAY I could give up my palacinke AKA Serbian Croatian crepes/pancakes or all the dairy, variety of cooked seafood, meats and poultry we typically have in our diet. But as I stated above, there is something that has got me intrigued. I would like to try it! I want to see the health benefits Kristina so passionately professes. Why Kristina went raw is outlined in her video as she suffered from Hyperglycemia all her 18 years and constantly felt drained, nauseous, had shocking migraines and very underweight for her height. Until 8 years ago........one day a man crossed her path in a whole foods store and asked her while she was going through the packs of granola whether she was a raw girl? This took her by surprise as she had no clue as to what he was referring to? Anyways for more on Kristina's amazing story please view her video here. 1). When you discovered you were hyperglycemic and you went down the raw food path. Did your body have any symptoms with the fruits eg: peaches you were just eating for the first week and then the vegetable and leafy produce thereafter??? When I first started eating raw, I literally ate nothing but peaches for two weeks straight. This is called mono-mealing. This is very cleansing and healing for the body for three reasons: 1) Eating one thing at a time is much easier for our bodies to digest. 2) Increases elimination because the body only has only one thing to process and eliminate. Things are easily "brushed through." 3) It is more natural to eat a smaller selection of fruits because that is how they are found in nature. It is rare that we find a grocery store selection in nature. When we find one fruit tree with ripe fruit, we LOVE to eat as much ripe fruit that we have off that tree until we are full, then move on to the next tree. Because I was very sick before I went raw, my body had a very positive reaction to eating more fruits. These simple sugars gave me energy, the fibers cleansed my body, and the vitamins fueled me! I was excited to cleanse and detox. For the first time in my life, my body felt ALIVE. 2). I know you suffered from severe migraines as a cause of your illness, do you know of any other fully raw people that suffered from migraines and no longer do due to this lifestyle change? Absolutely! I have personally coached people through migraines, cardiovascular disease, obesity, cancer, diabetes, arthritis, depression, etc. The list goes ON. I truly believe that any sickness can be reversed through a pure, FullyRaw lifestyle. 3). Are you okay with other people eating whole foods and meat? It is the choice of a person whether or not to eat a vegan diet. 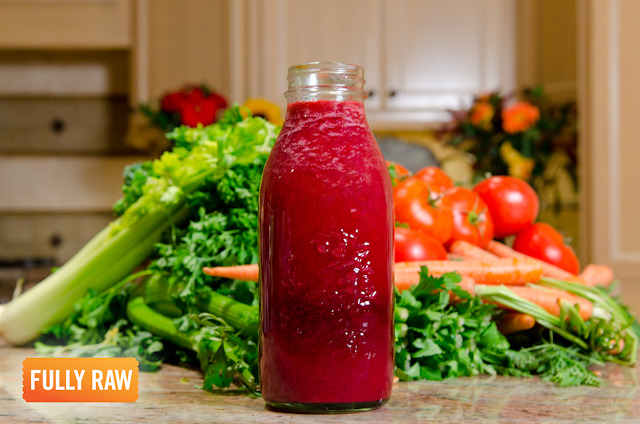 There are always more ways to incorporate more FullyRaw fruits and veggies in the diet without going totally raw. If someone follows the principles of proper food combining, they can also get great results regardless. This depends on the person and their beliefs about food. I went raw vegan initially for health reasons, but that has evolved over time. 4). How would you help people convert to just raw foods. Is there a step by step plan or just bite the bullet and eat fruit & vegetables. There are many ways to convert to eating FullyRaw. I know people who have jumped in over-night and I know people who have taken 7 years to finally commit. There is no wrong way to transition. You must feel comfortable, you must feel safe, and you must feel inspired. You want to feel confident in your journey so that you will succeed! I converted over-night, and for me this was easier because I made the commitment, and I found that I wasn't as easily tempted by other foods or confused about "acceptable" choices. However, this is rare. What I recommend to individuals who want to transition is to first start off with a juice or smoothie in the morning (32 oz.). After this step is complete, step two is to always have a humongous plate of fruit for lunch (about 1000 calories worth.) Once this is complete, step three is to always have fruit with a large rainbow salad. Then, if you want to have other things like meat or grains, to eat them after/with your dinner. Start in the beginning to reduce or eliminate dairy and meat products. This will create an enormous change in your health. Fruits and vegetables are high vibrational foods that will keep you properly fuelled, naturally thin, and internally clean. 5). Do you ever slip up and have a piece of cake or ever crave the "other" non raw foods? I have not eaten cooked foods in almost 8 years. I completely reversed my hyperglycemia (onset of type 2 diabetes) by eating raw. I LOVE every bit of my life SO much now that I have never had the desire to go back! 6). What is the difference between a vegetarian, vegan and raw food person? Vegetarians do not consume meats or fish. Vegans do not consume any animal products or animal by-products. This includes things like meat and dairy. Raw vegans eat food only nature's foods, uncooked, unprocessed, in their natural state. This includes fruits, vegetables, nuts and seeds, typically fresh, ripe, and whole/organic. By not heating the foods, you eat them when they have all of their life-force and maintain their enzymes. 7). What are some fun things you like doing on your own? With friends and family? 8). What are some exercises/sports you normally do? 9). What's your favourite perfume? I use only pure grade essential oils like Young Living and DoTerra. I love anything with patchouli, citrus, lavender, sandalwood, peppermint, or fresh spices. a. What's your favourite gem stone and why? How did you know?! :) Those who see me will always ask me about my bracelet collection! I literally have an entire ceramic bowl filled with original pieces/healing stones from friends that I have collected or personally crafted. My favorite is aquamarine because it is my birthstone. My favorite foods change as the seasons change, as I love to appeciate what nature gives me at every given moment. At the moment, my favorite juice is my SoulShine juice! It makes my skin glow, my energy high, and my belly flat! That juice is usually my breakfast! My lunch lately has been a HUGE bowl of blueberries, strawberries, raspberries, and bananas! For dinner, I am famous for eating citrus with ridiculously large rainbow salads! I make my own salad dressings, typically oil free and very savory using fresh herbs. There you have it!!! I hope this gives you a bit of an insight on raw foodism especially from the guru herself! Kristina is amazing and I found it unreal that people have completed healed themselves from various illnesses and disease by going on a fully raw diet/lifestyle. I need to get my Mum onto this as some of you may know she suffers from severe rheumatoid and osteo arthritis.